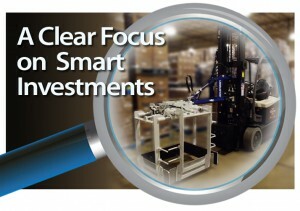 Pick accuracy, reliability, and cost-effectiveness are paramount priorities at CDS-operated distribution centers. Take the Henkel facility in Edwardsville, IL, for example: a new Cascade layer picker, mounted upon a new Crown forklift, serves as a solution to handle the DC’s most critical tasks. Layer picking technology at the Edwardsville facility aids with increasing throughput and responding to volatility in customer ordering patterns. The equipment allows for greater safety, higher quality, improved productivity, and more accurate inventory levels. CDS Logistics has been applying layer picking technology to Henkel order fulfillment since 2005. Now, this reinvestment in new equipment demonstrates CDS’ renewed commitment to fulfill Henkel’s customer orders in a consistent and timely manner. Surges in volume that would otherwise be difficult to manage are now easily accommodated. Combined with enhancements to the Warehouse Management System to administer the layer picking process, the layer pickers have delivered outstanding business results. EXCELLENCE IN EVERY CASE®. Our focus on improving people, processes, and technologies allow us to tailor warehousing support to meet your unique needs. Since 1991, CDS Logistics has been striving to meet and exceed Henkel’s targets for safety, accuracy, on-time delivery, and asset management. Our goal is to be a transparent part of Henkel’s supply chain while providing innovative cost reduction whenever possible.